Digital cameras and camcorders employ memory cards (flash-based removable media) for storage of captured content. There are different varieties of memory cards catering to various performance levels. CompactFlash (CF) became popular in the late 90s, but, has now been overtaken by Secure Digital (SD) cards. Many computing systems (PCs as well as smartphones) also support SD / microSD cards for augmenting local storage capabilities. We recently started in-depth evaluation of the performance of various memory cards. 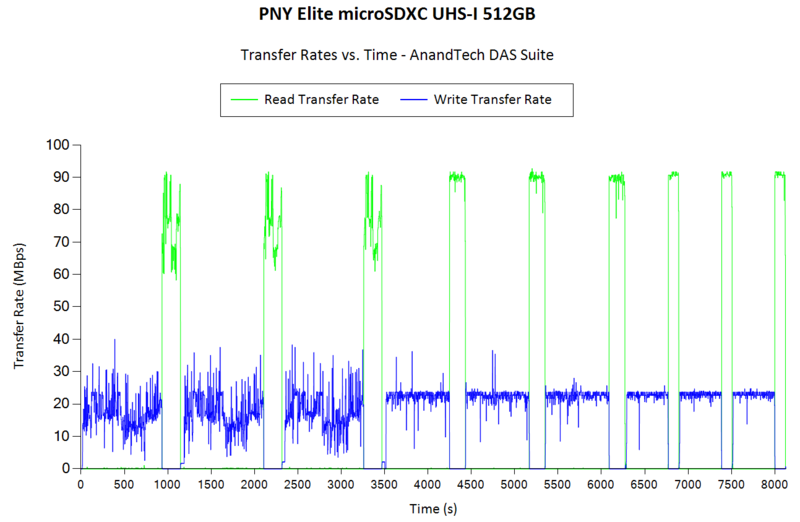 This piece evaluates one of the highest capacity microSDXC card currently available in the market - the PNY Elite microSDXC UHS-I 512GB version. SD (Secure Digital) cards were introduced in 1999, as an update to the existing MultiMediaCards (MMCs). It gained traction even in areas where CompactFlash had been preferred, thanks to its small size. Its popularity is evident by the fact that it has spawned two follow-ups in the same form factor - starting with the SDSC in 1999 for capacities between 1MB and 2GB, we got SD High Capacity (SDHC) in 2006 (up to 32GB) and SD eXtended Capacity (SDXC) in 2009 (up to 2TB). The cards also come in various sizes - standard, mini, and micro. Currently, the standard and micro sizes are more popular in the market. SD's popularity and affordability has meant that almost all consumer cameras come with a SD card slot. Recently, we have seen a number of high-capacity microSDXC cards getting introduced. Starting with the 400GB SanDisk Ultra microSDXC UHS-I card ($153 at $0.3825/GB) introduced in August 2017, we now have the Integral 512GB and the PNY Elite 512GB in the market as well. At Computex 2018, we also saw plans from ADATA and Team Group to sell 512GB microSDXC cards. With the industry migrating to 3D NAND, the capacity per die has seen significant increase, allowing for microSDXC cards to reach these capacities. The PNY Elite microSDXC 512GB is a UHS-I card with a Class 10 (Speed Class) / U1 (UHS Speed Class) / V10 (Video Speed Class) rating. PNY supplied us with a retail sample of their Elite 512GB card to put through our comprehensive memory card evaluation routine. Prior to taking a look at the performance numbers, we take a look at the testbed setup and evaluation methodology. Evaluation of memory cards is done on Windows with the testbed outlined in the table below. The USB 3.1 Type-C port in the testbed is enabled by the Intel Alpine Ridge controller. It connects to the Z170 PCH via a PCIe 3.0 x4 link. uSD cards utilize the Lexar Professional Workflow SR2 SDHC / SDXC UHS-II USB 3.0 Reader along with a microSD to SD adapter. For this particular review, we used the adapter supplied along with the PNY Elite card in its retail package. The reader was placed in the Lexar Professional Workflow HR2 hub and uplinked through its USB 3.0 port with the help of a USB 3.0 Type-A female to Type-C male cable. PNY claims speeds of up to 90 MBps, but, as the speed ratings (Class 10 / U1 / V10) indicate, this is only for the reads. Real-world write speeds are bound to be much slower. For most applications, that really doesn't matter as long as the card is capable of sustaining the maximum possible rate at which the camera it is used in dumps data. We use fio workloads to emulate typical camera recording conditions. We run the workload on a fresh card, and also after simulating extended usage. Instantaneous bandwidth numbers are graphed. This gives an idea of performance consistency (whether there is appreciable degradation in performance as the amount of pre-existing data increases and / or the card is subject to wear and tear in terms of amount and type of NAND writes). Further justification and details of the testing parameters are available here. With a fresh card, the writes are consistently above 20 MBps, but, after extended usage, we see dips down to the 17 - 18 MBps range. In both scenarios, the card manages to keep itself well clear of the minimum requirements for its speed rating. The read speeds meet PNY's claims of being in the 90 MBps range. 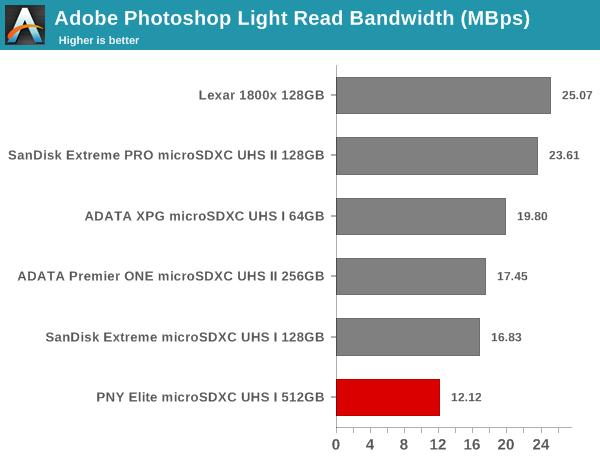 Almost all of the other microSDXC cards that we have evaluated before have higher sustained write rates, but, none of them belong to the same capacity class as the PNY Elite card. Typical of almost all memory cards, we see small files bringing down the write rates, but, the key takeaway here is that there is no consistency issue between two passes for the same data. The average transfer rates for each workload from the previous section is graphed below. 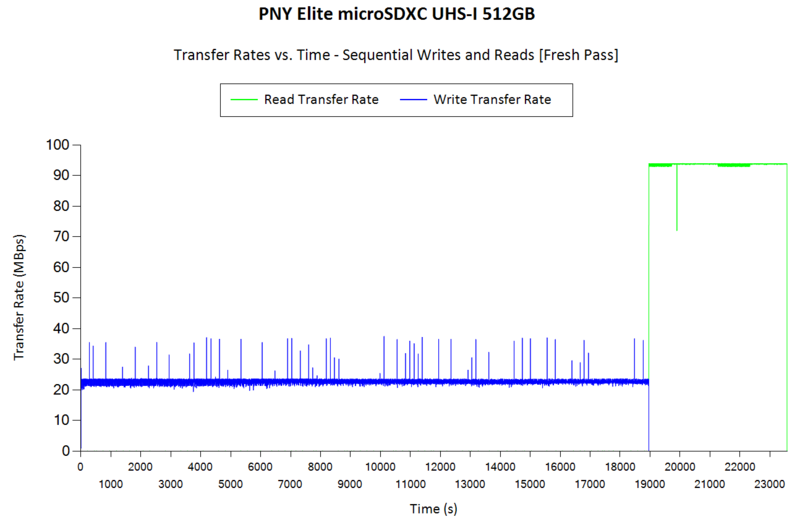 Readers can get a quantitative number to compare the PNY Elite microSDXC UHS I 512GB uSD card against the ones that we have evaluated before. The performance numbers here reflect the speed class rating of the card. As mentioned in the sequential writes section for the typical photo / video recording workload, the PNY Elite is not a speed play. Rather, it is a capacity play, which is not reflected well in this evaluation segment. We do see a drop in the write rate after performance restoration, but, it is similar to the numbers we see in the sustained write workload. The performance is still better than the requirements of the claimed speed rating. 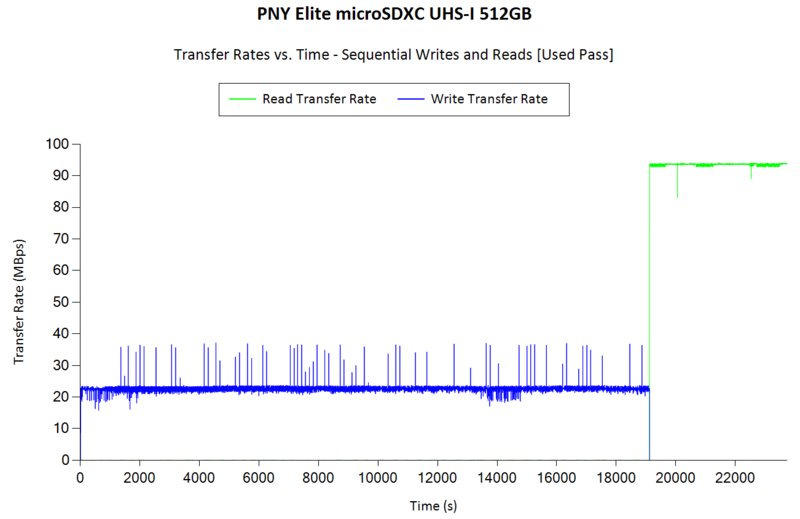 The PNY Elite microSDXC UHS-I 512GB card successfully completed our intensive benchmarking routines. It showed great performance consistency, but, emerged as an average / low-end performer with respect to the raw benchmark numbers. In addition to raw performance and consistency, pricing is also an important aspect. This is particularly important in the casual user and semi-professional markets, where the value for money metric often trumps benchmark numbers. 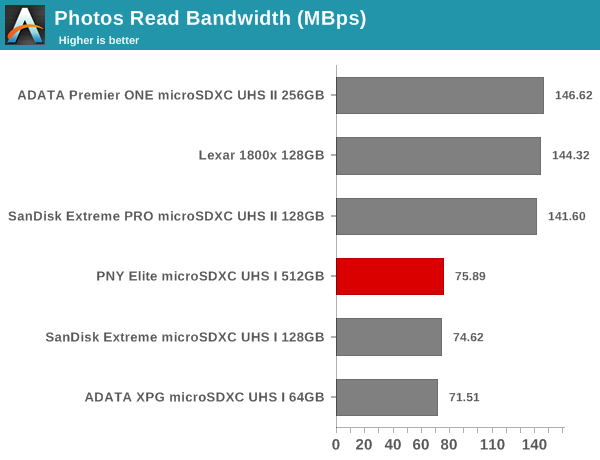 The table below presents the relevant data for the PNY Elite microSDXC UHS I 512GB uSD card and other similar ones that we have evaluated before. The cards are ordered by the $/GB metric. The PNY Elite card is not meant to be a benchmarks winner - rather, PNY wants to focus on the market segment which requires high capacity. This is an attractive card for content creators in the field who want to record a lot of content between imports to a bigger PC or network-connected mass storage device. It also targets users who can't afford the downtime / recording break that is inevitable during card swaps (when using smaller capacity cards). The SanDisk Ultra microSDXC UHS-I card ($153 at $0.3825/GB) also targets the same market segment with a similar speed rating, and it has a significantly lower per-GB cost. However, the PNY Elite does edge it out with a slightly higher capacity (512GB vs. 400GB). As indicated by its speed rating, the PNY Elite doesn't sport enough performance to consistently record videos with very high bitrates. But, it should be more than enough for content in the 80 Mbps range. The SanDisk Ultra microSDXC UHS-I card ($153 at $0.3825/GB) also targets the same market segment with a similar speed rating, and it has a significantly lower per-GB cost. What's up with the comma after every "but"? Makes for really annoying reading. Half a terabyte on a fingernail and people here only complain about price? My first experience at removable media were 5MB RK05 and 10MB DL10 on a PDP-11/34: You needed both hands to carry those! On the other hand I remember dropping a 4GB microSD somewhere sitting on my sofa and my frustration because I couldn't find or dig it out again: Too small! I'm not too anxious handling or even loosing 32GB microSD cards these days: They are the new floppy disks, but the thought of losing half a tera of family pictures at a slight bend, makes me cringe. RAIF? Or RAID? Regardless, you'll find that even a RAID array of these wouldn't perform very well. I don't think there are any good RAID controllers for SD cards AND you'll get less-than-perfect scaling of ~20MBps writes and ~90MBps reads.